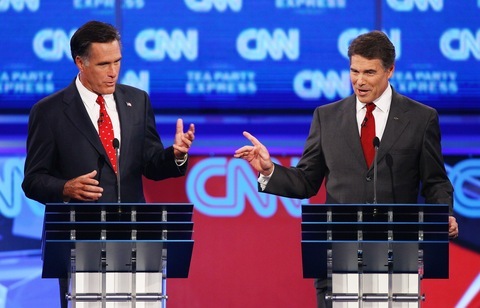 Republican presidential candidates Mitt Romney, left, and Rick Perry spar during Monday night’s debate; photo by Win McNamee/Getty Images. It seems the old saying “Don’t mess with Texas” doesn’t apply to Republican presidential debates, as Texas Gov. Rick Perry spent much of Monday night’s CNN/Tea Party-sponsored event in Tampa, Fla., under withering attack from many of his rivals on the stage. As was the case in Wednesday’s debate at the Ronald Reagan Presidential Library in Simi Valley, Calif., Perry and former Massachusetts Gov. Mitt Romney clashed repeatedly on issues such as Social Security and who is best equipped to jump-start job creation in the country. Perry softened his rhetoric on Social Security in Monday night’s forum, holding back his criticism of the program as a “Ponzi scheme” and “monstrous lie.” Instead he sought to reassure current beneficiaries and those nearing retirement that their plans would not be affected. “The people who are on Social Security today need to understand something: Slam dunk guaranteed, that program is going to be there in place for those. Those individuals that are moving towards being on Social Security, that program’s going to be there for them when they arrive there,” Perry said. “I think we ought to have a conversation,” Perry responded. “We’re having that right now, governor. We’re running for president,” Romney shot back. Romney also suggested that the recent success of Texas’ economy had less to do with Perry and more to do with the state’s favorable business climate, including an income tax rate of zero, few regulatory restrictions, a Republican legislature and oil resources. “I think Gov. Perry would agree with me that if you’re dealt four aces, that doesn’t make you necessarily a great poker player,” Romney quipped. Their sparring was expected, and Perry appeared to handle the encounters reasonably well, with the crowd applauding many of his responses. Perry ran into trouble later in the debate, when he was pressed to defend his decision mandating vaccinations of young girls as well as granting in-state tuition to children of illegal immigrants. Perry admitted he made a mistake in issuing an executive order requiring 11 and 12-year-old girls to receive a cervical cancer vaccine, which allowed parents to opt-out. Bachmann also questioned whether contributions to Perry’s gubernatorial campaign from the vaccine’s manufacturer, Merck, had anything to do with the order. “The question is, is it about life or was it about millions of dollars and potentially billions for a drug company?” Bachmann asked. Bachmann delivered a forceful retort, which drew loud applause from the audience. “Well, I’m offended for all the little girls and the parents that didn’t have a choice,” the congresswoman said. Perry was also booed by the Tea Party audience for his defense of a Texas plan that allows children of illegal immigrants who have been in the state for three or more years and are pursuing citizenship to receive in-state tuition. It also allowed Romney to come at Perry from the right on immigration. “We are the party of opportunity; we’re also the party of legal, law-abiding citizens,” Romney said. As long as Perry remains the front-runner for the GOP nomination, he can expect a Texas-sized bull’s-eye affixed to his chest. In all the coverage surrounding the special election in New York’s 9th Congressional District (Queens/Brooklyn), you might forget that President Obama’s name is not actually on the ballot. There’s little the White House can do to prevent a loss in a district the president won by 11 points in 2008 from being viewed as emblematic of his larger political woes. If, indeed, Democratic Assemblyman David Weprin is defeated Tuesday by Republican businessman (and “The Jerry Springer Show” creator) Bob Turner, the White House will, no doubt, seek to provide non-Obama related explanations for the loss. National Journal’s Marc Ambinder looks at the plans to do so already underway. To be sure, not knowing the size of the U.S. debt and dropping out of a debate did significant damage to Weprin’s candidacy and is part of the reason he wakes up Tuesday morning as the underdog in an overwhelmingly Democratic district. Nonetheless, Democrats in the White House and on Capitol Hill are keenly aware that the pervasive pessimism weighing down the president is likely to have a trickle down effect to his party. You need to look no further than Weprin’s awkward attempt at distancing himself from President Obama throughout the course of the campaign. “Former President Bill Clinton made a slew of last-minute robo calls to try to keep a Republican from winning a vacant congressional seat last held by by disgraced ex-Rep. Anthony Weiner. There’s much more at stake here for the Democrats than one congressional seat, which is why the Democratic Congressional Campaign Committee has been pumping in hundreds of thousands of dollars in the last couple of weeks. If Turner emerges victorious, Democrats will have to look elsewhere for which district they will lose because of redistricting. And if this Queens-Brooklyn district is this susceptible to the national political environment, it doesn’t bode well for Democratic chances at winning back the Staten Island-based 13th Congressional District won by Tea Party candidate Michael Grimm in 2010. Polls close at 9 p.m. ET in New York. Be sure to check here for results. There’s also a special election taking place in Nevada’s 2nd Congressional District, a Republican leaning district, where the GOP candidate is expected to win easily. Arizona Gov. Jan Brewer has set her state’s primary date for Feb. 28, 2012. That date is in violation of Republican National Committee rules that only allow for Iowa, New Hampshire, Nevada, and South Carolina to hold their nominating contests prior to March 6. In an effort to keep Brewer from jumping to a January primary date, the RNC offered up a party sanctioned debate among the Republican presidential hopefuls to be held in Arizona in December, which will put the state in the spotlight just before the voting process begins. Though the February date is in violation of party rules, it’s nowhere near as complicating as a January primary would have been. The four early states can move up a bit in response to Arizona’s date, but it’s not likely to send the kickoff caucuses into the Christmas season. The RNC is not out of the woods yet. Now all eyes turn to Florida and Michigan to see when those states choose to hold their primaries. But Gov. Brewer’s move has brought some clarity to a cloudy process. President Obama delivers remarks on job creation in Columbus, Ohio, at 2:15 p.m.
Former Utah Gov. Jon Huntsman holds a town hall in Henniker, N.H., at 6:30 p.m.
Former House Speaker Newt Gingrich attends a documentary film screening in Tampa at 7 p.m.
Texas Gov. Rick Perry speaks at the Pioneer Institute’s Better Government Competition Awards Dinner in Boston, Mass. at 7:45 p.m.